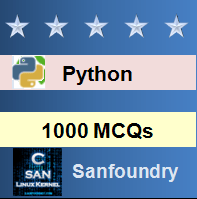 This set of Python Multiple Choice Questions & Answers (MCQs) focuses on “Encapsulation”. 1. Which of these is not a fundamental features of OOP? Explanation: Instantiation simply refers to creation of an instance of class. It is not a fundamental feature of OOP. 2. Which of the following is the most suitable definition for encapsulation? Explanation: The values assigned by the constructor to the class members is used to create the object. 3. What is the output of the following code? Explanation: The program has no error because the class member which is public is printed. 1 is displayed. Execute in python shell to verify. 4. What is the output of the following code? Explanation: Variables beginning with two underscores are said to be private members of the class and they can’t be accessed directly. Explanation: The purpose of getters and setters is to get(return) and set(assign) private instance variables of a class. 6. Which of these is a private data field? Explanation: Variables such as self.__b are private members of the class. Explanation: Here, get(self) is a member of the class. Hence, it can even return a private member of the class. Because of this reason, the program runs fine and 1 is printed. 8. What is the output for the following piece of code? Explanation: It is possible to change the values of public class members using the object of the class. 9. Private members of a class cannot be accessed. True or False? Explanation: Private members of a class are accessible if written as follows: obj._Classname__privatemember. Such renaming of identifiers is called as name mangling. 10. The purpose of name mangling is to avoid unintentional access of private class members. True or False? Explanation: Name mangling prevents unintentional access of private members of a class, while still allowing access when needed. Unless the variable is accessed with its mangled name, it will not be found. Explanation: Private class members can be printed by methods which are members of the class. Explanation: Name mangling has been properly implemented in the code given above and hence the program runs properly. 13. Which of the following is false about protected class members? Explanation: Protected class members can’t be accessed by name mangling. 14. What is the output of the following piece of code? Explanation: Protected members begin with one underscore and they can only be accessed within a class or by subclasses.